Heat oven to 350°F (325°F for dark or nonstick pans). Grease or spray bottoms only of two 8- or 9-inch round cake pans. Reserve 8 peach slices for garnish; cover and refrigerate. In blender or food processor, place remaining peaches. Cover; blend until pureed. Reserve 1/4 cup blended peaches for filling; cover and refrigerate. In large bowl, beat remaining blended peaches, the cake mix, oil, 1/4 cup whipping cream and the eggs with electric mixer on low speed 30 seconds, then on medium speed 2 minutes, scraping bowl occasionally. Pour into pans. Bake 8-inch rounds 31 to 36 minutes, 9-inch rounds 26 to 33 minutes, or until toothpick inserted in center comes out clean. Cool 10 minutes. Run knife around sides of pans to loosen cakes; carefully remove from pans to cooling racks. Cool completely, about 1 hour. In small bowl, stir reserved 1/4 cup blended peaches and 1/4 cup peach preserves until blended. Set aside for filling. In medium bowl, beat powdered sugar, butter, liqueur and just enough of the 2 to 4 tablespoons whipping cream with spoon or electric mixer on low speed until smooth and spreadable. Place 1 cake layer, rounded side down, on serving plate. Spread peach filling over layer to within 1/4 inch of edge. Top with second layer, rounded side up. Frost side and top of cake with frosting. In small bowl, stir 3 tablespoons peach preserves; carefully spoon preserves around top edge of cake, allowing some to drizzle down side. 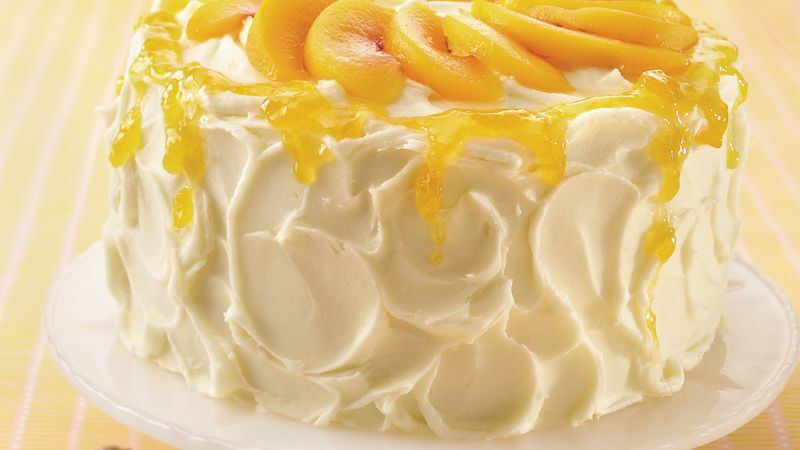 Just before serving, cut reserved peach slices lengthwise in half; place on top of cake. Store loosely covered in refrigerator. If you don’t have peach liqueur, use 1 1/2 teaspoons vanilla plus 2 tablespoons water. Peach liqueur gives the frosting a burst of ultra-peachy flavor. Try it drizzled over fresh peach slices and vanilla ice cream for a super-easy summer dessert.